The Nova mobile office pod supports the flexible working needs of the modern nomad with fast wifi, a minibar and a daily changing view. Owned by Cape Town co-working space Work & Co, the Nova pod can be transported between picturesque locations around the city and is the latest innovation in "out-of-office" work spaces. "Finding inspiration whilst still being productive was one of the strongest motivations for building Nova," explained Work & Co co-founder Jolize Pienaar. "Immersing yourself in different landscapes, whilst fully-equipped, enabling thought and productivity – the concept was just too attractive not to execute." Fully fitted out with fast wifi, a smart television, an Apple TV, a printer, white board, coffee machine, mini-fridge, charging station, power points, a bathroom and running water, the pod can support a handful of digital nomads at a time. Work & Co founders Julien Verspieren and Pienaar designed the two by five-metre pod from scratch. "It was quite a process getting all the technical aspects to work along with the look and feel I wanted," said Pienaar to Dezeen. "It took a lot of research and thought." The outside was designed by independent graphic designer Chris Moore, who also created the brand assets, including the pattern on the exterior of the pod and the customer station, to go along with the interior aesthetic. The pod runs solely on solar-generated electricity, which powers the kitchen and work appliances. "I was really involved with creating the curved wall by the kitchenette – it took a lot of trial and error but I think we got it," explained Pienaar. "It creates a subtle illusion of space, which is what we were after." "The stackable windows on both sides were also crucial to execute the concept. I was focused on creating a receptive space that would let the environment in." The wallpaper is part of the Savuti collection by Kwa'Zulu Natal-based design house Ardmore Ceramic Art. 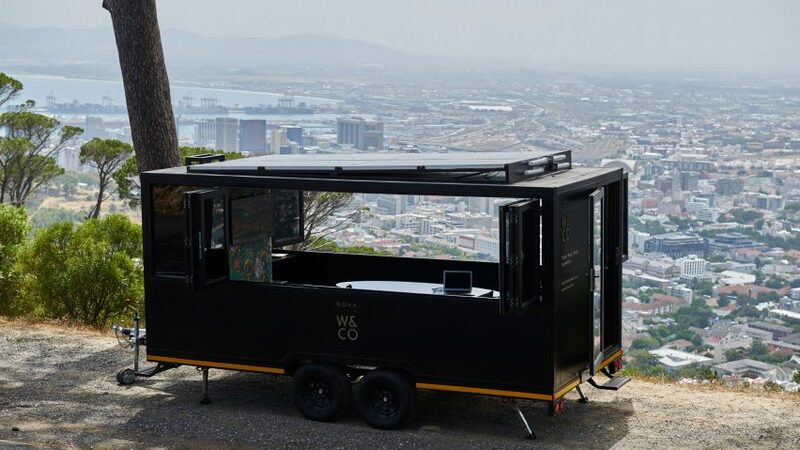 At the moment the pod has five predetermined locations around Cape Town, offering users a range of iconic views outside the city centre. Nova users can also arrange their own locations, and the pod can be deployed as a temporary office for events. "Innovation is something that lies very dear to our heart – the concept for Nova sort of sprouted up from discussing how I love what I do but don't necessarily want to be confined to a physical space," explained Pienaar. "Cape Town is the perfect city for the concept – we are so spoilt with having the most beautifully scenic locations around the city." Co-working space Work & Co opened in March 2016. The community comprises over 250 entrepreneurs, including local start-ups, global companies, financial technology collaborations, wine makers, architects, and advertising agencies. Designers across the world are rethinking what the office space has to provide, and even what office furniture might look like soon. Geoffrey Pascal has created a whimsical collection of office furniture that responds to the growing number of people working at home in their beds. The collection allows the user to work in positions that emulate being in bed.